Outscale has deployed a global network infrastructure based on state-of-the-art technologies. Outscale’s network infrastructure delivers class-leading response times and availability. With Outscale’s Cloud, you can choose to locate your data and applications in the geographical regions of your choice. You can migrate your data and applications yourself from one region to another and on the following continents: Europe, North America and Asia. We have deployed a global backbone, consisting of links for Outscale’s exclusive use, with leading Tier-1 global operators. 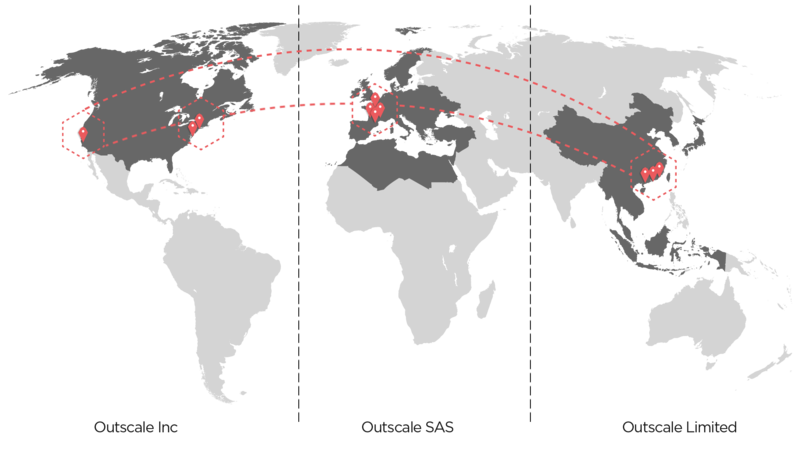 This backbone consists of submarine links spanning the whole planet: Europe – United States, Europe – China and China – United States. Our worldwide coverage is enhanced by the implementation of several Points of Presence (POPs) across the covered regions. All of our points of presence, which are themselves joined together with multiple links, interconnect to form a powerful, robust and highly secure global network. Thanks to Multi-AZ, your data is replicated across multiple data centres in the same region, and can be replicated across several different regions upon request. 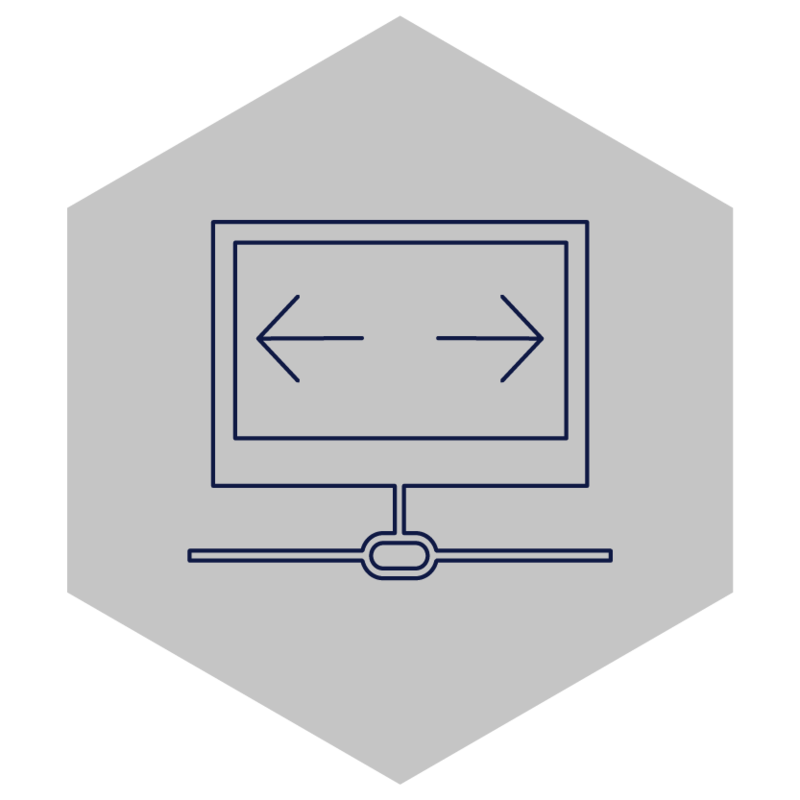 Replicating your applications and data gives you increased fault tolerance and higher availability. Our infrastructure is designed to ensure continuous, uninterrupted access to your business continuity services, disaster recovery plan, backup services, etc. 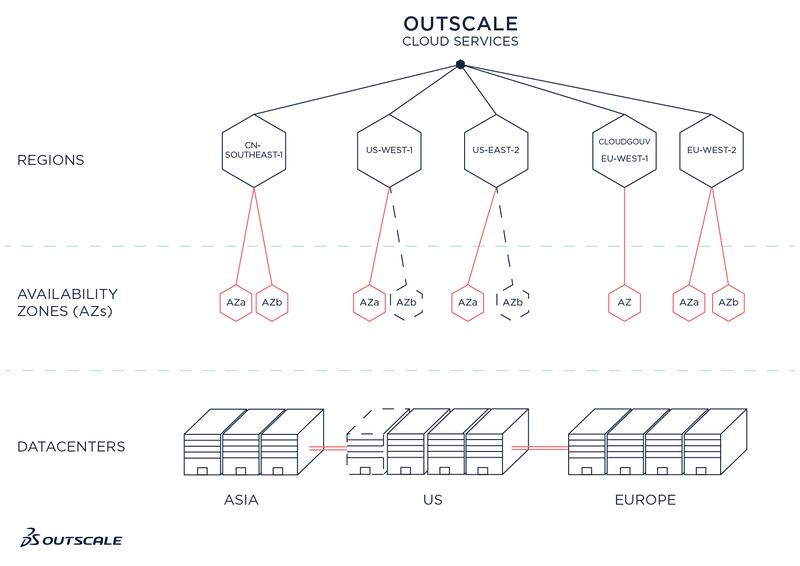 Outscale has connected all of its data centres at a regional level, thus providing high availability of access. This forms regional loops. And to improve latency and provide the best experience for users, Outscale has strengthened its Internet Peering Interconnection agreements by region. Each Outscale site has at least one 10 GiB Internet service. 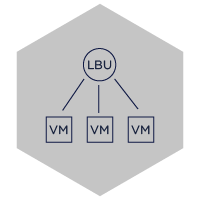 Connection offerings are available for connecting your private clouds: VPN and DirectLink.